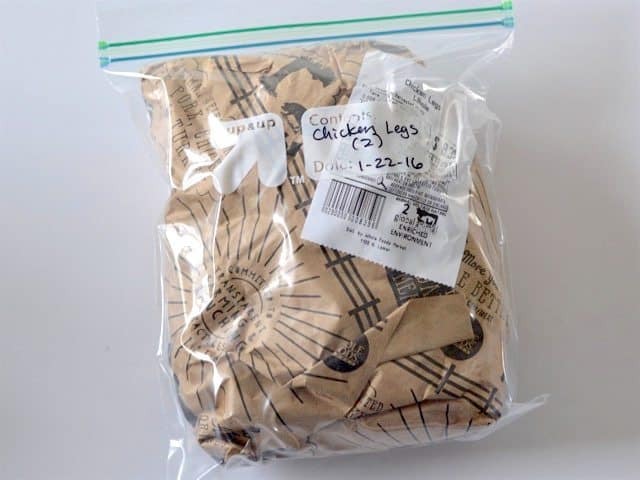 Chicken legs are often one of the least expensive cuts of chicken. Coincidentally, they are also my favorite part on a rotisserie chicken! 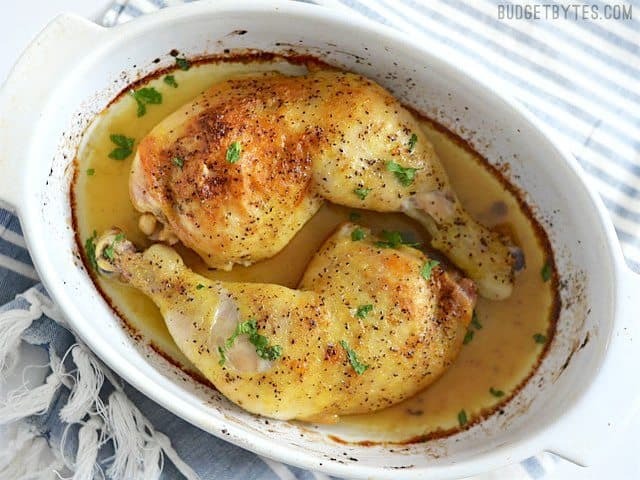 Since I lurrrve rotisserie chicken, I decided to try to make Oven Roasted Chicken Legs that were close in texture to the moist and tender rotisserie chicken that I so love. How would I accomplish that? Low and slow, my friends. Low and slow. When meat is cooked at a low temperature for a long period of time, it stays juicy and tender, and the connective tissues soften and caramelize into a tasty gelatin. The whole process is just meat magic. Rotisserie chickens are also constantly turned, which sort of self bastes the meat and keeps the juices constantly flowing through rather than out of the meat. I can’t do that in my oven, so I made sure to cover the meat tightly to prevent moisture from escaping, and I basted once or twice while the Oven Roasted Chicken Legs baked. Easy enough. 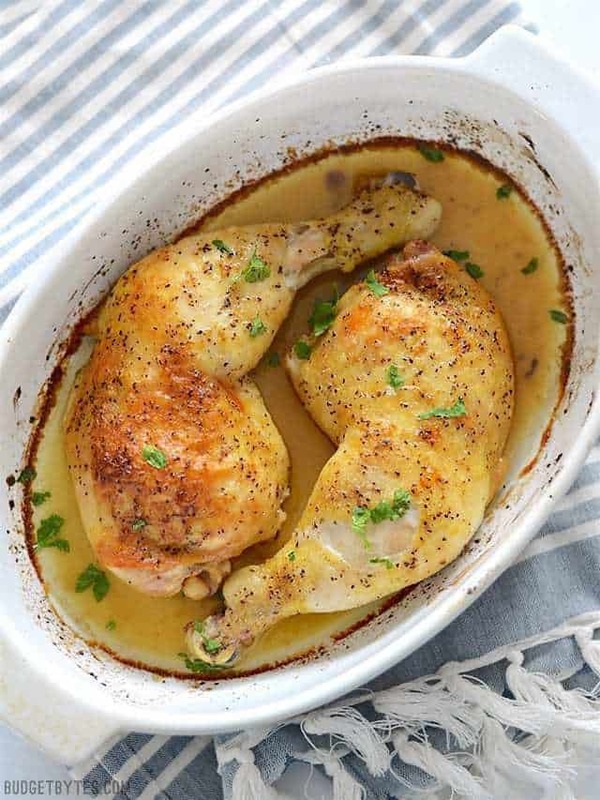 As far as seasonings go, you can use just about anything for these Oven Roasted Chicken Legs. I used my favorite blend du jour, lemon pepper seasoning, but you could do chili powder, steak seasoning, curry powder, taco seasoning, Cajun seasoning, chipotle pepper, or Herbs de Provence. There are so many options. I smeared my chicken skin with a little butter first, which I think actually made a huge difference. That little bit of creamy butter mixed with the chicken juices made the most incredible sauce ever. Sure, you can use olive oil or coconut oil instead, but butter… yeah, it’s just special. 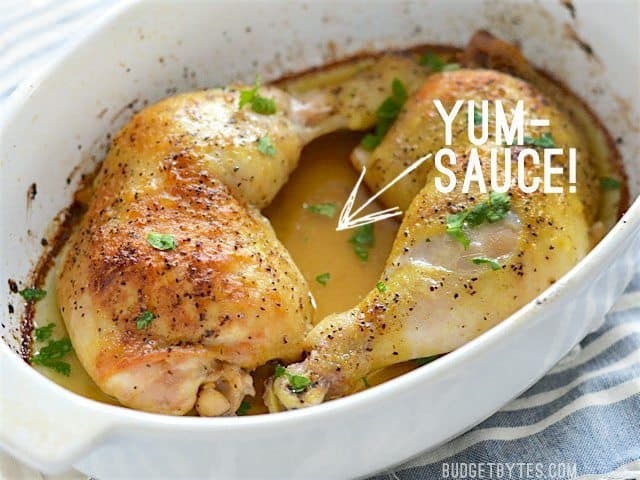 So, are you ready to see how to turn super inexpensive chicken thighs into a tasty, tender, main dish? 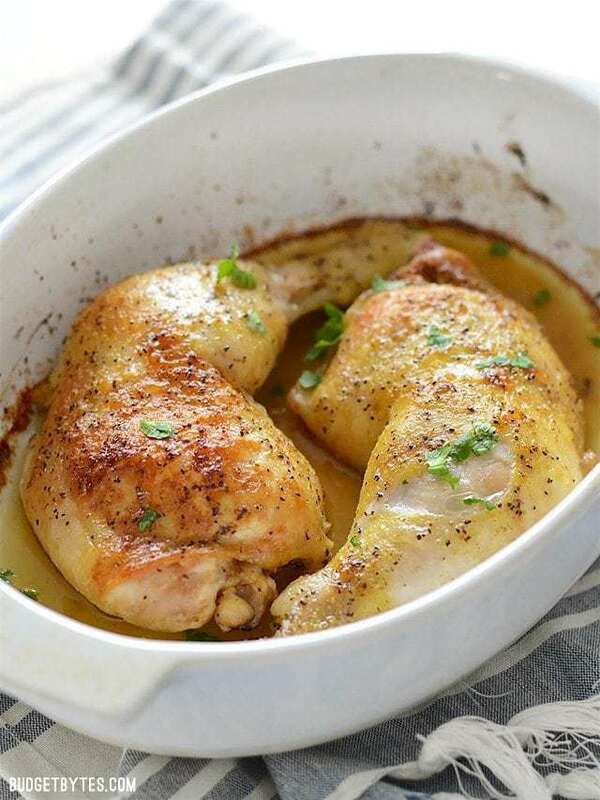 Oven Roasted Chicken Legs are juicy and tender, just like rotisserie chicken, but are made in your own oven. "Slow and Low" is the key. Preheat the oven to 300 degrees. Lightly coat the inside of a casserole dish with non-stick spray. 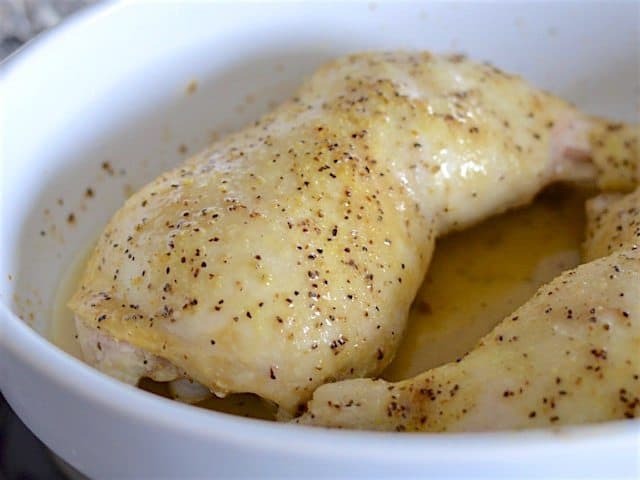 Pat the chicken dry with a paper towel, then smear butter over the surface of the skin. 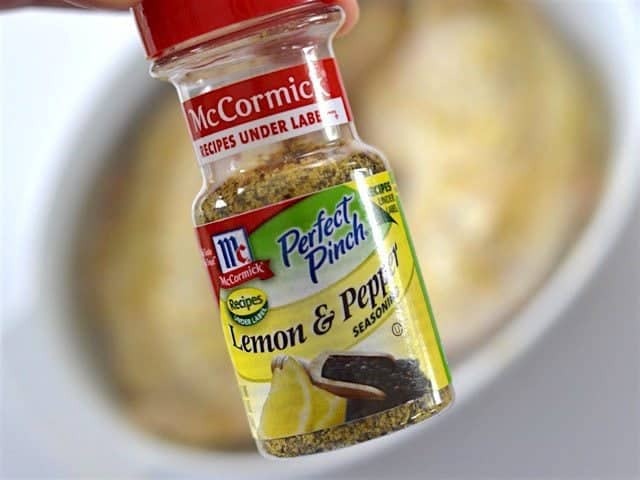 Sprinkle the lemon pepper seasoning liberally over both sides of the chicken pieces. Place the seasoned chicken in the casserole dish. Cover the dish with aluminum foil and bake for one hour at 300 degrees. Baste the chicken once half way through. After one hour, remove the foil, baste again, and turn the heat up to 425 degrees. Continue to bake the chicken at the higher temperature for 20-30 minutes, or until the skin has achieved the desired level of brownness. Serve with the juices spooned over top or with bread for dipping. *Or use your favorite seasoning blend. If your seasoning does not contain salt, be sure to add a pinch or two of salt to the chicken. 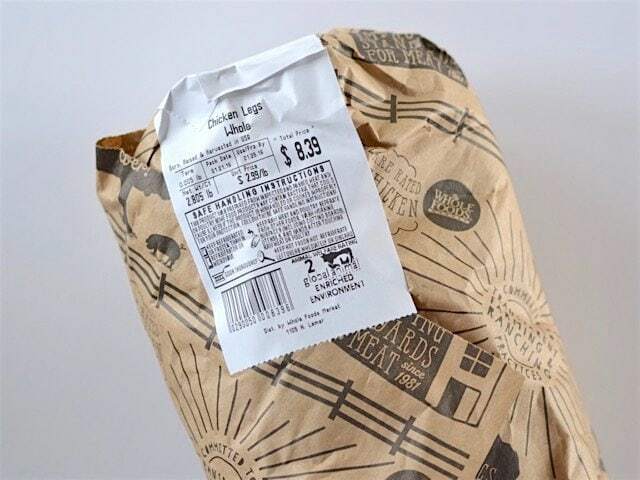 Since I’m trying to buy higher quality meat while staying in budget, I have to be really careful about what cuts I buy. These chicken legs were $2.99/lb., which is good for this particular store. I bought four whole legs (thigh and drumstick connected), and froze two for later. The two that I froze I simply wrapped back up very tightly in the plastic and wax paper that they came in, then sealed it off in a quart sized freezer bag (labeled and dated, of course). Anyway, back to the two that I cooked for the Oven Roasted Chicken Legs… Preheat the oven to 300ºF and pat the chicken dry with a paper towel. Smear about 1 Tbsp of room temperature butter over both pieces (1 Tbsp total, not per piece). Then season each side liberally with lemon pepper seasoning, or your favorite seasoning blend. 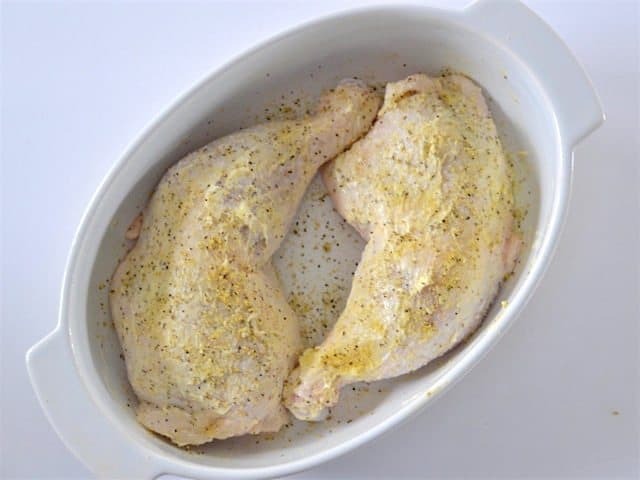 Place the seasoned chicken in a casserole dish coated with non-stick spray. I love this stuff because it’s kind of a one-stop-shop. It has salt, pepper, and lemon, which is my FAVORITE. Anyway, regardless of what seasoning you use, make sure to be aware about whether or not it has salt. If the seasoning is salt-free, you’ll want to add a pinch or two to the meat. Cover the dish tightly with foil, then bake in the preheated oven for one hour. Baste the chicken half way through (spoon the juices over top). After an hour, the meat should be quite tender, but the skin will be soft and blonde, like the photo above. To achieve that nice brown crispy skin, remove the foil and turn the oven temperature up to 425ºF. 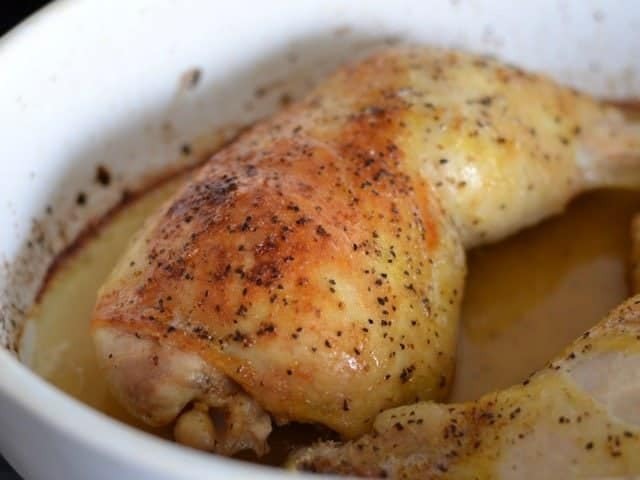 Bake the chicken for an additional 20-30 minutes at the higher temperature (you can leave it in the oven as it heats up to the higher temp), or until it develops the level of brownness that you like on the skin. The liquid that ends up in the bottom of the casserole dish is PURE GOLD. It’s like, one of the best things I’ve ever tasted, so don’t let that go to waste. I like to spoon it over whatever I’m serving the chicken with (if serving with rice or pasta), or serve some bread to sop it up. You can also pour it into a skillet, add a little white wine, and simmer it until it’s reduced to make a delicious pan sauce. Something about that butter, lemon, and pepper is just per-fect. What is the green leaf lastly added? Sorry, can’t tell.